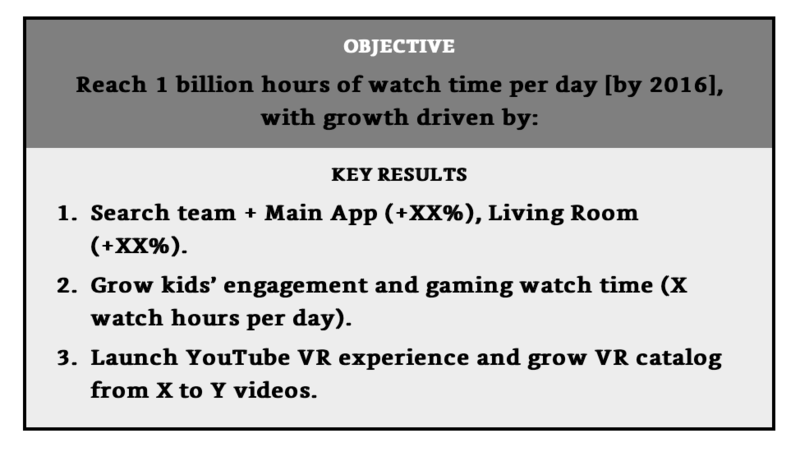 I’ve been using OKRs to set and measure organizational objectives since 2013 or 2014, when we first implemented them at onefinestay. I took the OKR process to Context Travel when I joined earlier this year. One of my top reads of 2018 was John Doerr’s ode to OKRs, Measure What Matters. Full disclaimer: I love OKRs and think they are the best goal-oriented management tool I’ve seen in practice. I’d enthusiastically recommend implementing OKRs to any size & type of organization. However I am very much approaching OKRs still as a student, not teacher: it’s a work in progress. A lot has been written about OKRs - objectives & key results - so I won’t attempt to rehash here. OKRs were invented by Andy Grove at Intel and popularized at Google. At its essence, OKRs are an process and an alignment tool to provide organizational focus in order to achieve better business outcomes by clearly expressing ‘objectives’ (goals) and' ‘key results’ - how we will know if we achieved the goal. OKRs are what turns organizational aspirations - wishes - into actionable initiatives. OKRs become particularly important as organizations scale beyond very small teams ( < 10 people) and begin to split out into functions or different locations. Informal systems of communication - e.g. open plan office chats - begin to break down. Functions inadvertently become siloed from each other - yet cross functional collaboration is needed to harness the full potential of the organization. One of the biggest risks with OKRs is that a lot of upfront time and effort is spent in setting OKRs at the beginning of the planning period, and then the OKRs end up in some document to be dusted off 30 or 90 days later. OKRs should form the drumbeat of the organization - it’s what we set out to achieve every month or quarter. I’ve found getting this to work in practice is really difficult. It’s still a work in progress for us. Our current OKR process begins about 15-30 days before the measurement period. We create a Google Doc & the leadership team inputs candidate company-wide OKRs. Functional leaders go back to their teams for feedback over the course of a few days, and we then gather for a half day together to decide at a high level what we are going to focus on in the upcoming quarter. An OKR isn’t a freebie that happens on top of lots of other initiatives - its the top initiative in the company and will create hard decisions around trade-offs. I’ve experienced lots of cake-and-eat-it-too OKR setting, & it doesn’t work. By committing to a handful of key things, another handful of things is not going to happen. An end of period wash-up that includes lessons learned. OKRs are not about achievement only, but learning. Once company-wide objectives are set, these are cascaded down to the functions, who in turn create their own set of OKRs. Good functional OKRs first and foremost are in direct or indirect support of company-wide OKRs, but this doesn’t need to exclusively be the case. Often functional OKRs have a little more leeway for long-term capability building & are at the discretion of the functional leader. However once set, they should follow a similar process with a written charter, accountable stakeholders (this time largely within the team), & a regular project cadence. OKRs are big bets, not to-do lists - OKRs should reflect a material departure from business as usual outcomes. It’s OK if a lot of the work that one does on a daily basis is not reflected in the OKRs. OKRs are all about what time is spent doing on the margin while busy doing other work, in addition to the overall the redistribution of that time generally. Less is more - there’s often the temptation for OKRs to become a wish-list of everything the leadership team wants to get done. I’ve never worked in an organization that can get more than a few big things done every quarter. Last quarter at Context, we actually set only 1 company-wide OKR, and it was way more impactful than the prior quarter when we had 4. This upcoming quarter we will have 2 company-wide OKRs. I would never suggest more than 4 for a company or a function. Good OKRs involve the majority of stakeholders - there’s often really important work that needs to happen at the functional level. However in my experience having a company-wide OKR that is really specific to a function - just because it’s really important - isn’t a great practice. Good OKRs should have the majority of relevant stakeholders - functional leaders at the company level, key team members at the functional level - knowing ‘what to do about it’ after the OKR has been set. If actions taken at the individual level to achieve an OKR aren’t obvious, it may be appropriate to recut the OKR itself or drop it down to functional OKRs or individual initiatives. Don’t fetishize the software or format - I spent a long time demoing OKR software to find the perfect tool for our organization, and it looks like we are just going to revert back to Google docs. Of paramount importance is that OKRs are living and breathing in the organization. The best OKR platform is probably one you are already using, so I would suggest hitching OKRs to whatever tools are common in the org - Slack, Google docs, etc. Is this an ‘initiative’ or a KR? Is this a KR or an objective? Don’t obsess. Just having a structured forum where team members explicitly convene around common goals is 90% of the magic. I’ve read a lot about Google’s OKR process, & even they don’t follow one specific OKR format consistently. Use OKRS to build your org design & ID key gaps - OKRs are an amazing way to identify key gaps in the organization. It’s fairly common for personnel needs to be a bottoms-up activity that only somewhat relates to the key goals of the organization. All leaders should want more resources - that’s normal. However it’s hard to then figure out what trade offs to make when setting or freeing up budgets. The OKR process, with all stakeholders laid out for everyone to see, will give a great window into where the real needs are. Don’t have enough data to measure success against? Maybe it’s time for a dedicated business insights hire. Find the OKR management cadence to be too difficult? Maybe it actually makes sense invest in a project manager. And so on. What are some of other lessons or OKR best practices that others have learned at their own companies?